KIEV, Ukraine -- As deadlines near on the future of Ukraine's ties with Europe, President Viktor Yanukovych is under pressure to put aside personal animosity and let his jailed opponent, Yulia Tymoshenko, go to Germany for medical treatment. 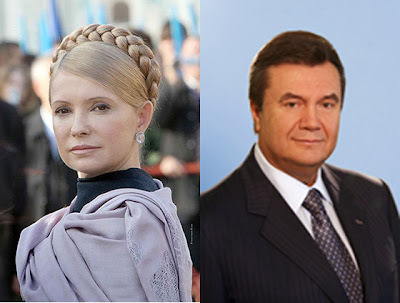 Yulia Tymoshenko (L) and Viktor Yanukovych. Softening Yanukovych's hardline stance on his arch-rival is seen as crucial if Ukraine is to secure the signing of landmark agreements, including a free trade deal, with the European Union at a November summit. But, diplomats say, the 63-year-old president knows that allowing her to rejoin the political fray would endanger his run at a second term in 2015, given her formidable populist appeal and her organizational skills. "The proposal is for Tymoshenko to go for treatment in Germany on condition that she does not take part in Ukraine's political life," wrote Dmitry Korotkov in Segodnya newspaper. "He wants her politically dead," one diplomat told Reuters. For some months now, EU heavyweight Germany has been formulating a plan to provide Yanukovych with a way out - quietly pushing a "humanitarian" solution in which Tymoshenko could be received for medical treatment in a Berlin hospital. This formula - so the logic goes - would allow Yanukovych to show himself in a good light and might ensure signing of planned agreements on political association and free trade with the European Union at the Vilnius, Lithuania, summit. "In his intensive exchanges with counterparts in the Ukrainian government, Foreign Minister (Guido) Westerwelle has reiterated the government's offer of medical treatment for Yulia Tymoshenko in Germany," the German foreign ministry said in Berlin. Envoys from the European Parliament who also last April helped secure the release of a Tymoshenko ally, visited Ukraine again last week, pushing "the German option" as a way of breaking the deadlock over Tymoshenko. But it is still unclear which way Yanukovych will jump and his administration continues to pile up charges against her. His fears she could re-emerge as a political threat to him no matter what the conditions attached to a humanitarian pardon, have led to tortuous negotiations, an EU insider said. According to this source, the Yanukovych camp is insisting as part of any deal that she must pay back more than 1.5 billion hryvnia (about $188 million) in estimated damages to the Ukrainian economy caused by her alleged reckless conduct as prime minister. "The thinking is that that would prevent her financing any campaign against him," the source said. Brushing off EU charges of "selective justice", his aides repeat the mantra that the rule of law has to be respected. Yet an end to the impasse promises Yanukovych rich rewards. The free-trade agreement potentially on offer from the European Union would open up a huge market for Ukrainian exports - steel, grain, chemicals and food products - and provide a powerful spur for much-needed foreign investment. That would be a boon for a country traditionally reliant on trade with Russia and guarantee Yanukovych a place in the history books, something aides say he still aspires to. An EU deal is also in the interests of influential power brokers in Ukraine such as steel billionaire Rinat Akhmetov and others, and Yanukovych has consistently set European integration as a foreign policy priority.